A new study about cougars finds the big cats are more plentiful and widespread in the Midwest than a decade ago. The recent findings are detailed in the Journal of Wildlife Management, according to the Milwaukee-Wisconsin Journal-Sentinel. The presence of cougars was confirmed 178 times in the Midwest and as far south as Texas between 1990 and 2008, according to the story. Confirmed sightings of Midwest cougars were sporadic before 1990, when there were only a couple. That rose to more than 30 by 2008, the story reports. Michigan authorities issued a public statement in May about a verified cougar sighting in the Upper Peninsula. 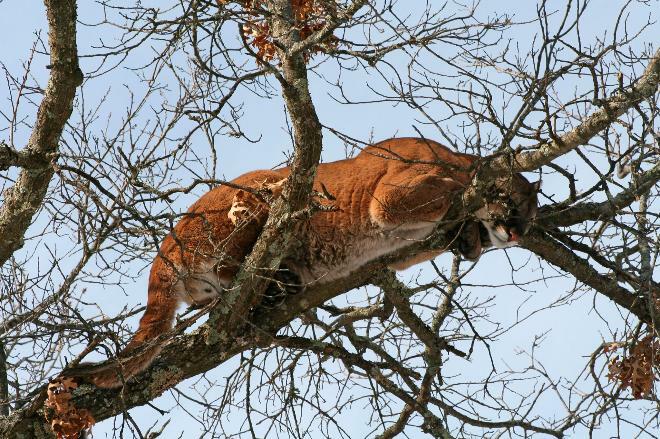 The cat was photographed by Fred Nault, a Baraga County resident. The cat was observed near Skanee. This entry was posted in Uncategorized and tagged Cougar, DNR, Nature, Wildlife. Bookmark the permalink. If your readers are interested in learning more about the history and ecology of cougars in the Midwest, I suggest they read my recent book: Phantoms of the Prairie, the Return of Cougars to the Midwest by the U.of Wis. Press and available on Amazon.com. Thanks for the tip John. I’ll look it up. Nice article. In Maine, there are cougar sightings reported every other week, yet fish and game officials won’t acknowledge their presence. People have game camera pictures of them, footprints, pretty conclusive evidence. Sooner or later one is going to end up hit on the interstate and the proof will be insurmountable! Thanks searunner: Michigan officials were like that too, in many ways. Its only in recent years that they have what they say they have needed: verifiable evidence. Prior to that claims were often dismissed or passed off by saying the state has no thriving, reproducing population, only possibly transients or escapees. The current position is that Michigan does not have a breeding population, but cats are moving through the state. At least one collared study animal has been photographed by trail cams several times. It is thought to have to Michigan from the Dakotas.